Friday night is "Pizza Night" at our house. We all know I like to sneak extra veggies in wherever I can, so I usually puree all kinds of extra vegetables into my tomato sauce to get a little more into the kids when they eat their favourite cheese pizza. 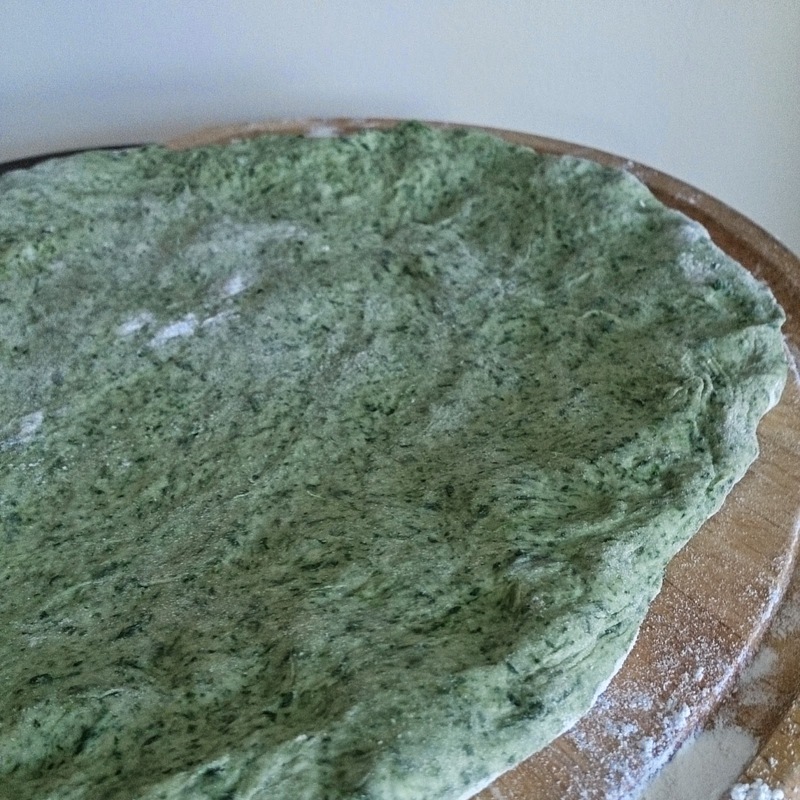 When I saw this recipe for spinach pizza dough, I knew it would be the ultimate way to take their cheese pizza from good to great. Combine yeast and sugar in warm water. Allow to rest for 5 minutes or until yeast is active and foamy. Meanwhile, using an immersion blender or food processor, puree spinach (in liquid from package). In a large bowl, combine flour and salt. Once yeast is foamy, add yeast mixture, spinach, and olive oil to flour. Stir to combine into a rough dough. Knead until the mixture is elastic. (A stand mixer with the dough hook is excellent for this!) Cover dough, and let rise for 20 minutes. Divide dough in half to give you enough for two 12-inch pizzas. Stretch pizza dough and top as desired. Bake at 400` for 15-20 minutes. I chose to make one 12-inch pizza immediately, and to bake the 2nd crust as a plain shell. It is waiting in the freezer for a quick last-minute meal some day soon! Alternatively, you could stretch the entire batch to make a large pizza on a baking sheet. Here's a close-up to show you the colour of the cooked crust. It has a greenish hue and small flecks of spinach, though you really can't taste them or detect anything different in the texture. The kids gobbled it up without a second glance!